MizB at Should be Reading hosts this weekly event. What books have you been wishing to buy/get lately? Found while looking for "Cat Sleuth" books for the challenge. 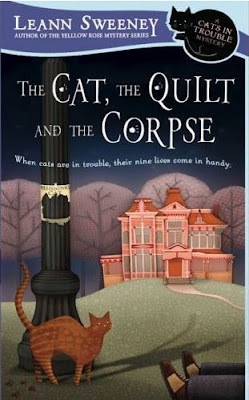 "Jill’s quiet life is shattered when her house is broken into and her Abyssinian, Syrah, goes missing. Jill’s convinced her kitty’s been catnapped. But when her cat-crime-solving leads her to a murdered body, suddenly all paws are pointing to Jill. Soon, Jill discovers that Syrah isn’t the only purebred who’s been stolen. Now she has to find these furry felines before they all become the prey of a cold-blooded killer—and she ends up nabbed for a crime..."